The below artworks are the most important in Neo-Dada - that both overview the major ideas of the movement, and highlight the greatest achievements by each artist in Neo-Dada. Don't forget to visit the artist overview pages of the artists that interest you. Artwork description & Analysis: Cage's Theater Piece No. 1, also known as simply "The Event," was a seminal performance for the evolution of Neo-Dada, paving the way for the movement's signature collaborations and multimedia basis. Conceived by Cage, the piece involved several simultaneous, unscripted performance components including a poetry reading, music, dance, photographic slide projections, film, and four panels of Robert Rauschenberg's White Paintings (1951) suspended from the ceiling in the shape of a cross. While Cage set certain guidelines for which medium each performer used, he let each individual artist determine the specifics of their role within the performance, emphasizing the function of chance in determining the course of the event. 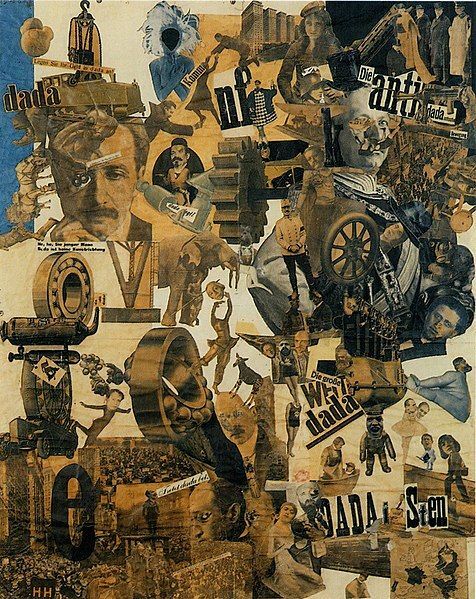 The aspects were all integral to the development of the Neo-Dada aesthetic as well as later performance art, and were encapsulated within this one work in which many of the key artists within the Neo-Dada movement played integral roles. Artwork description & Analysis: Johns' use of newspaper and other media dipped in encaustic made each mark distinct and visually linked his work with the Abstract Expressionists, despite the very different processes that were involved. Rather than creating an abstract work like the action painters before him, Johns relied upon the images and signs common to American culture. 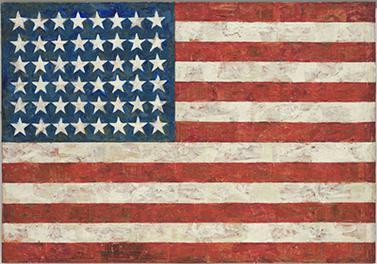 He shifted the focus from the artist's mark to the interplay of emblems, language, and the media through his use of found objects embedded within the hardened wax "brushstrokes" that constitute the larger image of the American flag. Artwork description & Analysis: In Suite for Five, Cunningham emphasized the movements of dancers in groups, specifically a duet, a trio, and a quintet. The program for the original performance introduced the work by stating, "The events and sounds of this ballet revolve around a quiet center, which though silent and unmoving, is the source from which they happen." The evolving contrasts between sound and silence, movement and stillness created a dynamic tension that guided the course of the performance. John Cage's Music for Piano was the score for the piece, and relied upon the composer's use of a prepared piano with felt, screws, and woodblocks fitted in and around the strings. Robert Rauschenberg created the costume designs, which consisted of earth-toned leotards. Both Cunningham and Cage relied heavily upon chance in the creation of this work, citing that both the score and the choreography were determined by random operations like counting the imperfections in a piece of paper. Cunningham's emphasis on choreography as an art form in its own right was highlighted through his development of the dance elements outside of the score, costumes, and stage set. This focus also underscored the importance of the individual movement of the artist/dancer, which initiated the evolution of performance art that directed the viewer's attention to the body of the performer rather than the narative or the theatricality of the dance. Artwork description & Analysis: In this particular work, Rauschenberg took a worn pillow, sheet, and quilt, scribbled on them with pencil, applied layer upon layer of oil paint, toothpaste, and fingernail polish, quoting Jackson Pollock's drip technique in the application of each, and finally framed all of these elements within wood supports. Although this work is neither specifically a "readymade" nor necessarily an action painting, Rauschenberg references both Dada and Abstract Expressionism in his usage of found objects as well as the application of the paint to those objects. 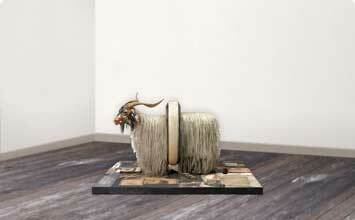 Rauschenberg effectively broke down the separations between painting and sculpture, and asked the viewer to look at modern art in a wholly new way. Through his revolutionary combination of disparate elements into a new medium that drew its subject from the surrounding world, Rauschenberg helped solidify the Neo-Dada aesthetic. Artwork description & Analysis: With the whole sculptural environment encapsulated within a shipping crate, Kienholz created a self-contained tableau that incorporated diverse materials such as fish tanks, plaster casts, fiberglass, hospital beds, bindings, a bedpan, and neon tubing for this particular installation. With these found materials, Kienholz presents the viewer with two emaciated figures bound to their beds, sharply recreating a scene he witnessed as an orderly in a psychiatric ward. Unlike the New York Neo-Dada artists, Kienholz did imbue his works with a pre-determined meaning, which always related to his critiques of contemporary society and culture. However, through his use of found materials and his emphasis on the viewer's experience of, and dialogue with, the artwork, his connection to the Neo-Dada aesthetic and its emphasis on the surrounding world is clear. Artwork description & Analysis: In this piece, Kaprow divided the gallery into three connected spaces. Over the course of ninety minutes, Kaprow and the other performers enacted simple movements like bending over, bouncing a ball, and playing records while lights and slides flicked on and off in pre-determined sequences. The audience was instructed to move from room to room at intervals throughout the work - no longer separated from the performers - they experienced the same sights and sounds as those performing. The first official happening performed within a gallery, 18 Happenings bears the diverse set of influences typical of Neo-Dada. Through the emphasis on the artist's movement as a performance, the happenings referenced the action painting of artists like Jackson Pollock, but, in this case, the movement itself became the work of art. And by allowing the happening to occur in a largely unscripted manner, Kaprow embraced Cage's notion of allowing chance to dictate the composition of an artwork.